The National Credit Union Administration (NCAU) and the Federal Trade Commission (FTC) began enforcement of the Red Flags Rule on January 1, 2011. This rule applies to creditors, financial institutions, and persons who regularly participate in credit decisions. Under the Red Flags Rule, businesses are required to develop and Implement an “Identity Theft Prevention Program” to detect, prevent, and mitigate identity theft in their day to day operations. Additionally, you must also have a method in place for detection of Identity Theft Red Flags. 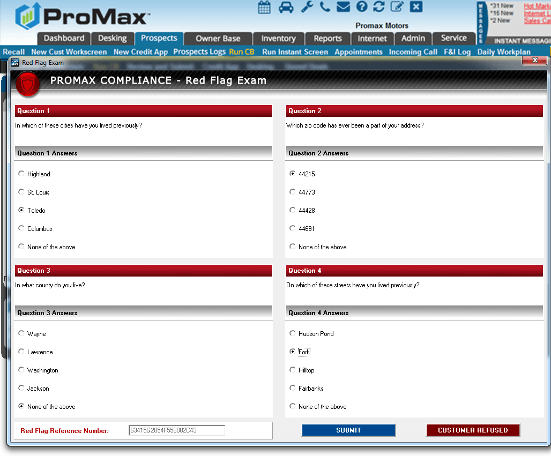 ProMax offers a seamless solution to the Red Flag Rule requirements. We will provide your dealership a Compliance Manual template to jump start your Identity Theft Prevention Program. We will also provide our Risk Assessment Process for you to individualize as necessary. For detecting Identity Theft, we’ve developed a comprehensive Fraud Scan Alert system in ProMax. When a credit report is pulled, the consumer’s Red Flag “Score” will be determined based on certain fraud indicators. If the score requires dealership action to confirm the consumer’s identity, a message will pop-up to notify your staff. The ProMax Red Flag Exam will provide four “out of wallet” questions used for identity authentication. When completed, the exam results will be saved on the customer record. 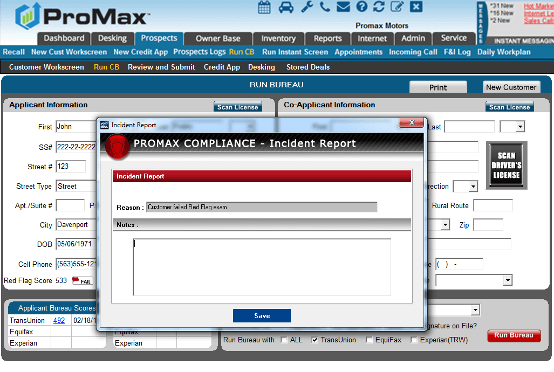 Any required Incident Report can then be completed and stored in ProMax for annual reports and audits. 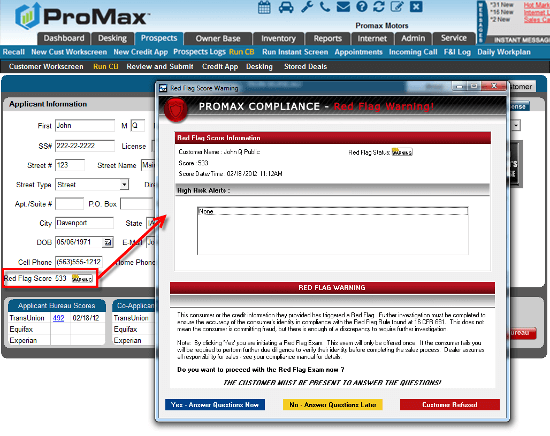 Based on certain fraud indicators, a Red Flag Scroe is generated when credit is pulled in ProMax. If the flag is yellow, the credit information provided has triggered a Red Flag. Automatically, a warning is displayed on the screen indicating further investigation is required to verify the accuracy of the consumer’s identity. When an exam is failed or refused, an Incident Report is automatically generated for completion. As with all compliance related issues, the incident is recorded with the customer in case a audit. Incident reports are permanently recorded on our compliance summary report for review.